This pizza sounds absolutely fabulous! Lovely recipe! This sounds amazing, and perfect for NJ corn and tomato season. I eat mostly gluten free, so I'd love to try this out on a chickpea crust I've wanted to try. I bet the flavors would pair nicely! This may be a little bit out there, but it's making my stomach growl. So it's happening. 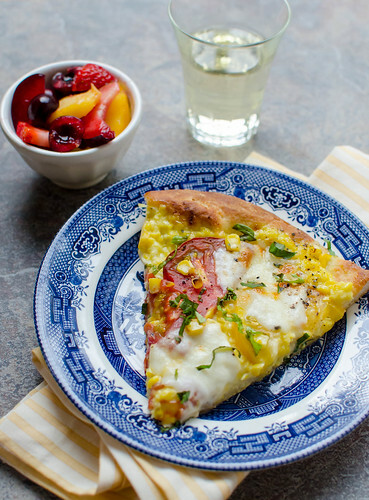 Looks like a great twist on this pizza, will definitely be trying this weekend. Hope it turns out as great as your picture looks! I love corn on pizza. Love it. So why haven't I tried it as the sauce?! That needs to change asap. I used two ears of corn that yielded a scant cup and a half, so I’d recommend using three small ears!